We take many extra steps to ensure every fish is premium quality , which means means a longer shelf life, bright color, fresh ocean smell, firm texture, and superior flavor. All our fish is caught by a select group of quality minded fishermen. Our fishermen take the time to handle every fish with care, thoroughly bleed and quickly chill to preserve quality. Because we are a small custom processor, we have small batches with superior temperature control and traceability to the fisherman. We combine artisan techniques with the latest technology, such as using an ozonator to slow bacteria growth and increase shelf life. Our high standards don’t stop at our fish. We pride ourselves on customer service and look forward to meeting your every need.  If you have any questions or concerns, please don’t hesitate to call (907) 424-7755 or email sales@sixtynorthseafoods.com. 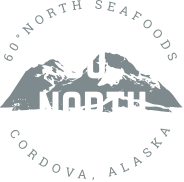 60 North is ready to buy and sell 2019 season salmon, halibut, sablefish – in portions, H&G (whole fish w/ heads and guts), fresh & frozen, value added 60 North is Copper River Fisherman owned. Founding owners are multi-generational fishing families that have been selling their own harvest direct to consumers for years. Founding owners products are recognized as the pinnacle of quality even within the premium seafood sector of Copper River. 60 North offers traceability from fisherman to consumer. Copper River Fresh (CRF) is our product line that was created specifically for delivering premium FRESH fish directly chefs. Co-founder, John D. Wiese developed and permitted a special method of cleaning the fish on his boat and shipping directly to chefs within hours of catching the fish. John is our fresh expert; he’s upgraded his boat to provide premium quality, and he’s been direct marketing his fresh catch for years. We have delivery service available in Seattle, Wa and San Antonio, Tx. Please call or fill out the form below. We've got you covered with Sena Sea! Sena Sea is our retail product line, created to deliver the premium quality fish we catch ourselves right to your door. Co-founders Rich and Sena Wheeler created Sena Sea years ago as a way to share their catch while honoring their families multi-generational fishing history and commitment to ocean stewardship. We catch all the fish ourselves, hand cut into 6oz portions, wrap in parchment paper (to preserve superior quality), vacuum seal and freeze. Sena Sea products and gifts are available seasonally as well as year-round and shipped anywhere in the U.S. right to your door. Place orders directly on the Sena Sea website. We ship every Monday.